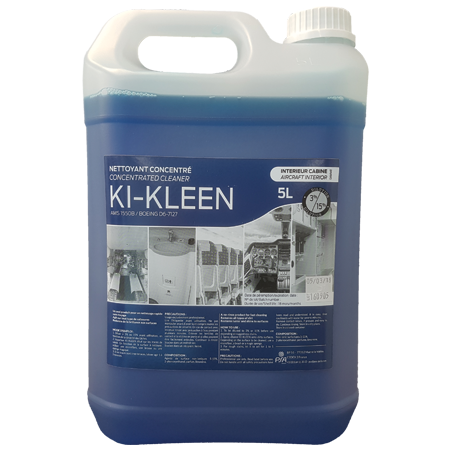 Ki-kleen is a multipurpose concentrated interior cleaner that can be used on various metal, plastic, textile and leather materials. It guarantees a quick and easy cleaning action without the need for rinsing. It gives the surfaces their original shine without leaving any marks. This product is designed for routine cleaning and reconditioning of all types of soiled surfaces. KI-KLEEN contains biodegradable cleaning agents to completely destroy all soils. Tested stains: coffee, tomato sauce, red wine, ink stain, luggage traces on polycarbonates. With its neutral pH formulation, it does not alter surfaces or corrode metals. Compatibility on substrates (aluminum alloys, polycarbonates, acrylics, vinyl, rubber, carpets, textiles, etc.) has been demonstrated according to aviation standards.